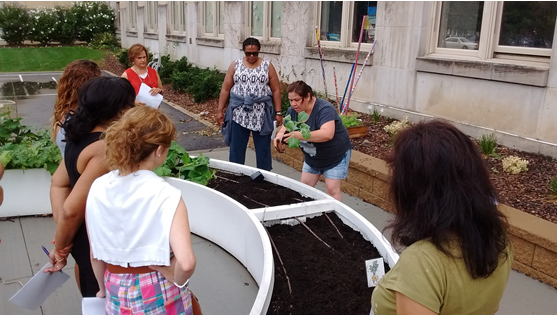 Space to Grow transforms Chicago schoolyards into beautiful and functional spaces to play, learn, garden, and be outside. Schoolyard transformations prioritize physical activity, outdoor learning, and community engagement. The green schoolyards incorporate landscape features, such as rain gardens, native plantings, and permeable asphalt and pavers that capture a significant amount of rainfall to keep the city’s water resources clean and reduce neighborhood flooding. The schoolyards also serve as extensions of the classroom for lessons ranging from science experiments to nutrition education. The grounds feature areas for exploration like outdoor classrooms, native trees and plants, and vegetable gardens.